I find the most decadent foods to usually be homemade. It just so happens that they also usually contain chocolate. This is another recipe from Barb, who I am convinced has made some of the most amazing dishes I’ve ever encountered. It should come as no surprise, since her husband was a world-renowned chef. It’s no secret that I love chocolate. I could eat it for breakfast, lunch and dinner, and that’s no exaggeration. 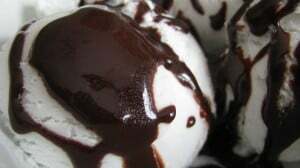 I usually don’t like chocolate syrup or chocolate fudge sauce – I find many of them to be fake tasting or too runny. However, this homemade fudge sauce is divine. It is also super simple and quick to make. And it’s thick and fudgey, too. Just the way I like it. I’m sure a ‘healthier’ version of this could be made, but I don’t feel there is a reason. It’s not as if you are going to eat a cup at a time, and a tablespoon or so won’t derail you from your goals. Unless, of course, you are like me and eat it by the spoonfuls once you are finished making it. In order to make myself feel better about that, I drizzled some over Coconut Bliss ice cream. It was incredible. I also may mix a little into my Greek yogurt later . . . Mmmmm. Once it has reached the desired thickness, remove from heat and stir in butter and vanilla. Serve on ice cream, crepes, or yogurt. Now please go make some of this, and store it in a little container in your fridge. It is fabulous cold. I would know, since I’ve been having scheduled tastings on a daily basis. Oh sweet mercy mercy! I made this, and it was incredible. Also ate it off a spoon, how could I not? I think it will be a staple on ALL THE FOODS from hereon in.